When Susan asked me what other place I've been wanting to try on my growing list of places to check out in Chicago, somehow BIG and little's came to mind. I couldn't remember for the life of me where I read about them or what was special about them, but I just knew we should try it. We went after work one day and walked into this small restaurant. Half of the space was devoted to an open kitchen and there was a counter on the other side with bar stools where some people were eating their food. It was very bare bones, it literally felt like they just decided to set up shop one day and started doing business. There's a little chalkboard menu posted up on their wall. Truffle fries were also listed on the menu so we got an order of that. Susan says she hasn't seen the soomeenshee facial expression of euphoria in awhile, but these fries brought it out of me. They cook all the food to order and you can see the chef literally toss these fresh from the fryer. These fries were perfectly seasoned and had just the right amount of truffle oil on them. 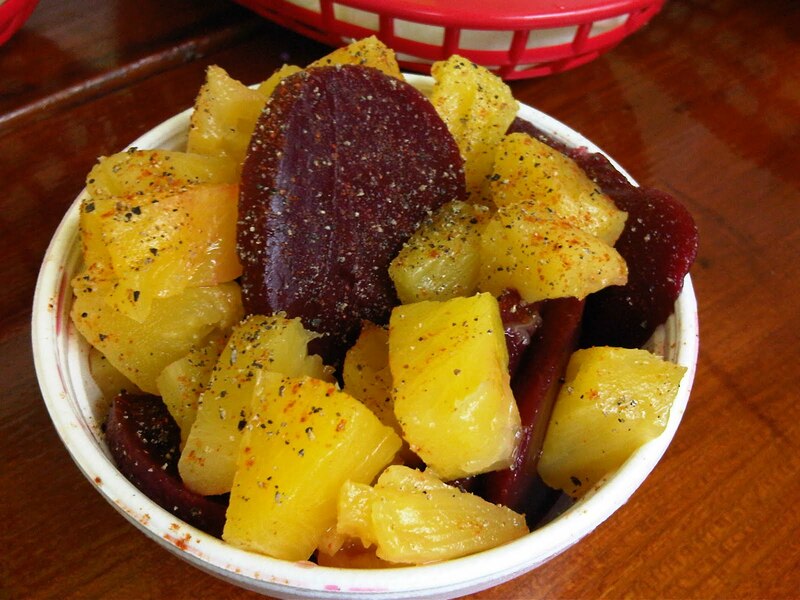 For our other side, we got the beet and pineapple salad. I love beets, but this was a big let down. This was basically canned beets and pineapples sprinkled with some black and cayenne pepper. Maybe it was a bit naive of me to expect to get roasted beets and fresh chunks of pineapple in a side salad that costs only $2.50, but what can I say, I've been spoiled. =) Susan, on the other hand, commented on how sweet the pineapples were. I had to gently break it to her and explain that it's because they are canned. Her response was that she needed to go buy some at the store next time. lol. Susan is so easy to please. Although we were intrigued by the fried egg hamburger, the tacos and tostadas were calling out to us so we tried those instead. Here is a shrimp and fish taco. They were grilled and came with a tasty sauce and tons of cabbages or lettuce. 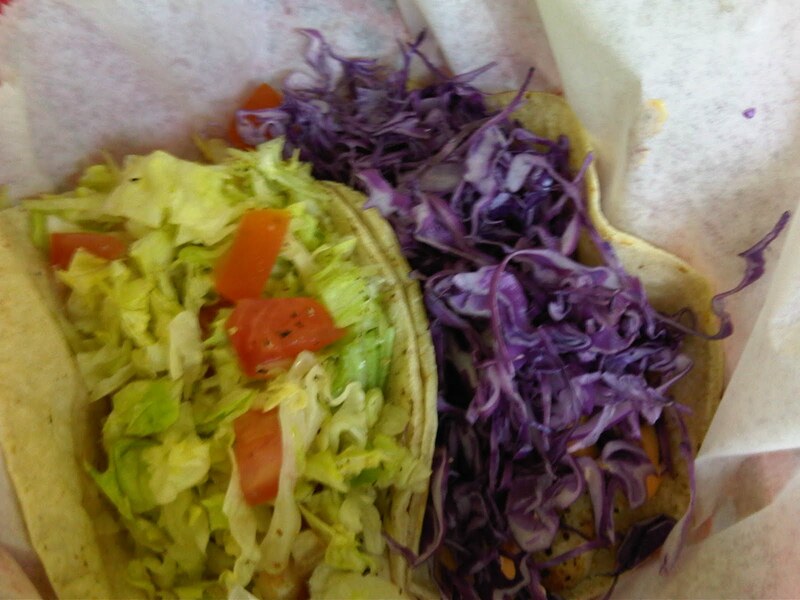 I appreciated that there were different toppings for the different tacos. 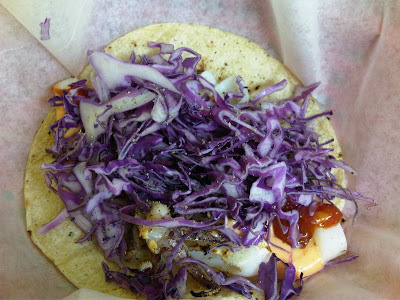 Here is a picture of the squid tacos, also very good. It looks like I will be able to get my taco and truffle fry fix in Chicago after all. This was the crab tostada. 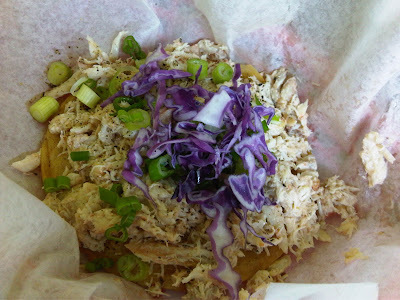 It was a fried tortilla piled high with fresh crab meat, some lemon juice, black pepper, cabbages and green onions. It was very mild in taste and a bit too bland for Susan, but I couldn't get over the fact that it was practically all fresh crab meat. I thought it was great. 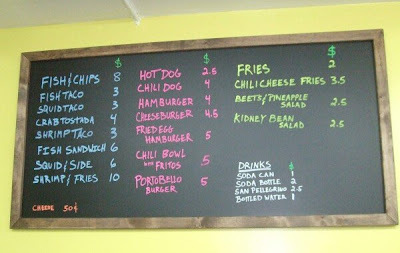 Yes, you might lose interest in eating it if this was the only thing you were eating, but steal a couple bites of tacos and fries here and there and it works. So while we were eating, we saw some of the press that the place has garnered and it's because one of the chefs, Tony D'Alessandro, was a contestant on the sixth season of Hell's Kitchen. Duh! So that's why he looked so familiar! I actually chatted with him for a bit and he was super nice and really laid back. He said that they plan to put out some picnic tables outside during the summer. I told him I'd definitely be back to try some of their other offerings and that I loved the fries. The prices are reasonable and the food is tasty. If only this place was slightly closer, I'd be stopping by all the time. do you remember FATBURGER'S fried egg burger? i love fries so much we're doing a FRY-HOP here in state college soon... it's sorta like a BAR TOUR that college kids do on weekends.... but instead of bar hopping, we're going to different places to eat french fries. Yes I remember Fatburger's fried egg burger. Yum! I love anything with a fried egg on it. haha. A fry-hop? That's hilarious. I wonder how many places you guys can hit up. That sounds like my kind of activity. Truffle oil is basically flavored oil that tastes like truffles, a really expensive mushroom that kind of tastes musky and earthy. 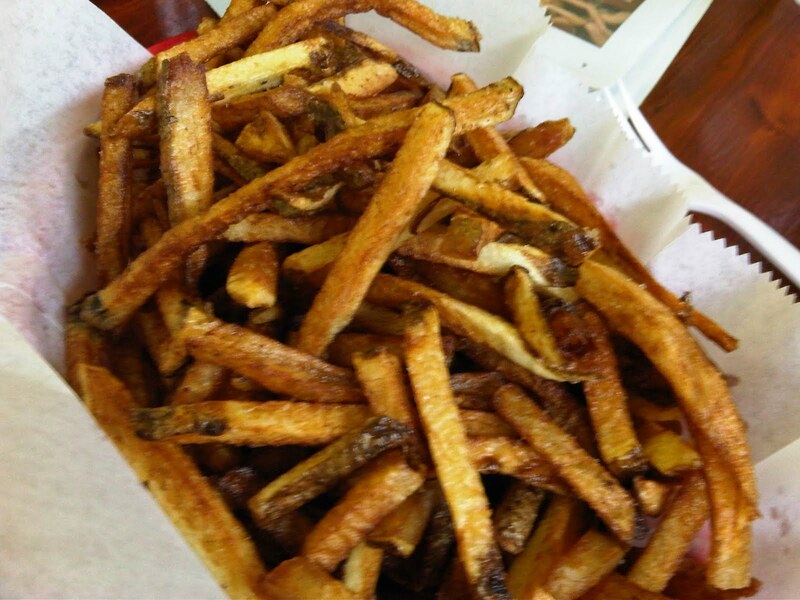 You should try truffle fries, they are delish!